After some solid food, now comes the time for some fine drinks. Complete your Thanksgiving feast with these tantalizing mocktail recipes. Enjoy your Thanksgiving. Combine cranberry juice, pineapple juice, orange juice, cherry juice and lemon juice. Shake it well to combine these. Use ice and serve it over ice. Embellish the mock tail with cherry and slices of orange. Use an electric mixer to blend ice, pineapple juice, milk, cream and sugar. Mix it until they are not fully blended. Use a saucepan to combine lemon juice, orange juice, sugar, water and springs mint. Stir it properly until sugar is dissolved. Keep it aside for some time, cool it. 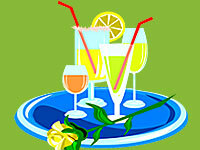 Use glasses and mix the fruit juice, ginger ale and water in equal amounts. Add ice before serving the mock tail. Honey, vanilla extract, sliced bananas, vanilla yogurt and crushed ice should be added in a blender in the exact order. Make the mixture smooth by gradually increasing the speed of the blender. 1. Fill a highball glass with ice and orange juice. 2. Slowly pour grenadine over the juice, it will sink to the bottom and slowly rise to the top as you drink. Process all ingredients in a blender until smooth and creamy. You can add more or less soy milk to get the consistency that you prefer. 1. Pour the juices into a collins glass filled with ice. 1. Pour the peach nectar into a Champagne flute. 2. Slowly add the Champagne. 1. Pour the juices into a collins glass half filled with ice cubes. 2. Top with the ginger ale. 3. Garnish with orange and lemon slices. 1. Pour the juices into a cocktail shaker with ice cubes. 3. Strain into a chilled collins glass filled with ice. 4. Garnish with the slices of pineapple and/or orange. 1. In a blender, add 1 cup ice, pineapple juice and cream of coconut. 3. Pour into an chilled hurricane glass. Combine tomato juice, lemon juice, Worcestershire, horseradish, celery salt, sugar, hot pepper sauce and black pepper, stirring well. Refrigerate for 1 hour. Place 2 or 3 tablespoons of seasoned salt in a saucer. Rub rims of serving glasses with a lime wedge. Spin rims of each glass in salt to coat; set aside. Fill each prepared glass with ice; pour tomato juice mixture to fill. Garnish with celery stalks. Add limes, lemons and olives, if desired, to your garnish. Mix together first four ingredients. Serve over ice. Garnish with lemon slices. mocktail after garnishing with an orange slice. instructions on the packet. Just before serving - in a blender add pulp, jelly chunks, colour, essence and water. Blend very lightly. Pour into glasses and mix in finely crushed ice. Use wide straw for serving. If you wish to add variety, use different fruits with matching jellies, colours and essences like pineapple, orange, grapes, etc. In a medium-sized saucepan, combine all of the ingredients except the lemon twists. Heat to simmering and then pour into serving mugs and garnish with the lemon twists. Now your mocktail is ready. Mix all ingredients in little water. When dissolved add the soda or iced water. Pour in 2 glass. Sprinkle chopped mint. Serve immediately.